Mr. Mike had a momentary panic because he forgot to prep the grill, resulting in the torn burger. But once you slap the bun top on, it makes no difference. You may have some leftover uncooked ground beef and be short on time. The following recipes are tasty and easy. The recipe called for tomato paste, and fresh ginger, which I did not have so I scrounged. The recipes come from the May 2013 issue of Real Simple. You may be aware Martha Stewart played a big role in starting this magazine. The recipes bear some of her fingerprints. I took care of that. 1. Heat 1 tablespoon of the canola oil in a large skillet over medium-high heat. Add the scallions and ginger and cook, tossing, until softened, 2-4 minutes. Add the beef and cook, breaking it up with a spoon, until browned, 3-5 minutes. Add the soy sauce, tomato paste, sugar, ¼ teaspoon pepper, and ½ cup water and cook, stirring, until slightly thickened, about 1 minute more. 2. Toss together the cabbage, carrots, cilantro, lime juice, sesame oil, remaining tablespoon of canola oil, and ¼ teaspoon each salt and pepper in a large bowl. 3. Fill the buns with meat and serve with the slaw and lime wedges. 1. Heat the skillet over medium-high heat, adding no-stick spray if you like. Add the beef, onions, and ginger and cook until browned (a bit of crust is even better), about 5 minutes. If using regular ground beef, drain any excess fat. I recommend using ground chuck or round because the fat will be sufficient to cook the onions without having to drain any excess fat. Why use canola oil when the beef has all the fat needed? And why use scallions? The green parts will turn a nasty olive green if you cook it as the recipe describes. Just use regular onions, chopped (about ½ cup). The onions are supposed to turn brown and that’s fine. And what’s with slipping the water into the directions and not in the ingredient list? Actually, I doubt ½ cup water will be sufficient for the ¼ cup tomato paste. Use about ¾ cup tomato sauce instead. No need for water. If you don’t have fresh ginger, about 1 teaspoon ground ginger will get you by. The meat mixture thickened up in about 1 minute using the tomato sauce. 2. Proceed as directed, although giving specific amounts of vegetables ( i.e. 2 cups) would be helpful to the average person. One person’s 2 carrots could feed an army of rabbits while mine might be sufficient as scrounge cat toys. 3. Suggest toasting the buns. 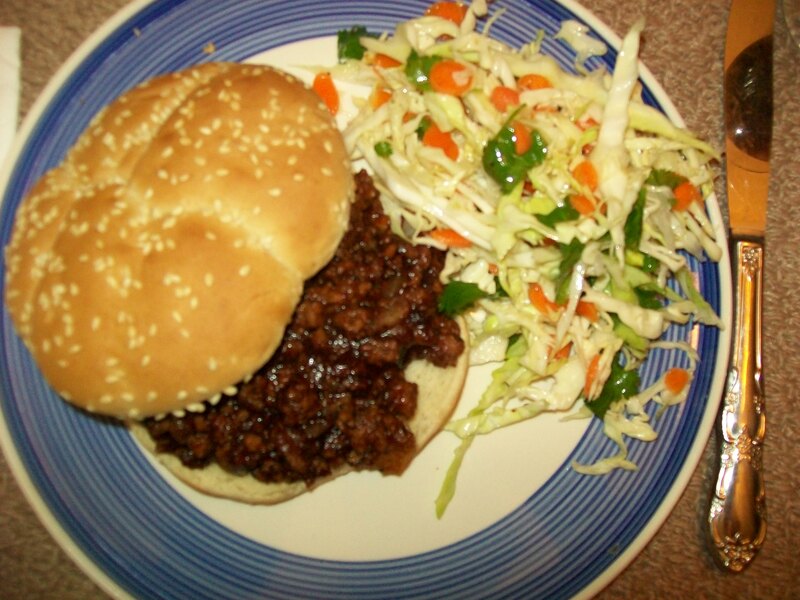 Im not to sure how I feel about sweet and sour sloppy joes, but you cant knock it till you try it! Thanks for sharing! Thanks for visiting! It’s not something I would have created on my own. I look in my cabinets and refrigerator to see what’s on hand, then search recipes for a match, or near match. I suspect Scrounge Cat is just out of shot? Yes, the scroungers are never far away. They prefer their beef straight up, cooking is optional. Love it! Good to give up all those unnecessary steps. Sometimes when I look at recipes, I really wonder if this is how they really cook it at home when they don’t have assistants and interns around. I used to test/develop recipes in another life. You’re right. If the steps don’t make sense, the cooks will ignore them and do what they want to do, which may not have the desired outcome. And why fuss around anyway? Life is too short. Congratulations on successfully completing a semester of teaching! That’s right! Remember, it’s only food. Thanks for reading my blog! I ain’t fancy, just pragmatic. Thanks for reading my blog, man! The ‘Joes are tasty if you can get past the frou frou directions. 🙂 If you ever want to read some funny and inspirational stories, you are more than welcome to come my blog and have a Cup of Joe.